1992 Ngingingawula Jilamara Kapi Purunguparri (Our Designs on Bark), NGV, Melbourne. 1993 The Body Tiwi Aboriginal Art from Melville and Bathurst Islands, The University Gallery, University of Tasmania Launceston. 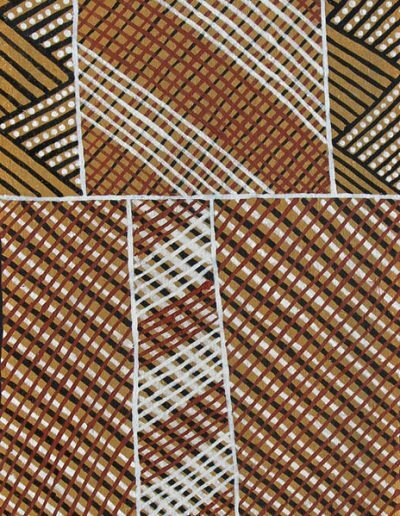 1994-95 Art of the Tiwi, National Gallery of Victoria, Melbourne and touring Shepparton Art Gallery, Tasmanian Museum & Art Gallery, Ballarat Fine Art Gallery, Tandanya Adelaide. 1995 Jilamara Kapi Yurruka Manimpurrua, (Designs on Long Canvas and Pukumani Poles). Alcaston Gallery, Melbourne.